Vijayashanthi, the ‘Lady Superstar of South Cinema’ turns 50 today. Raaga.Com wishes her birthday greetings and takes a peek into her illustrious journey in cinema when she ruled the South film industry in the 80’s and 90’s in different avatars be it tragic, glamour or action. Her popularity reached to such zenith that she even became a household name in North belt thanks to her Bollywood hits like TEJASVANI and EESHWAR. Beginning her career as a heroine in Tamil film KALLUKKUL EERAM in 1980 she soon graduated to a star actress after her Telugu movie NETI BHARATHAM (1983) proved super hit. 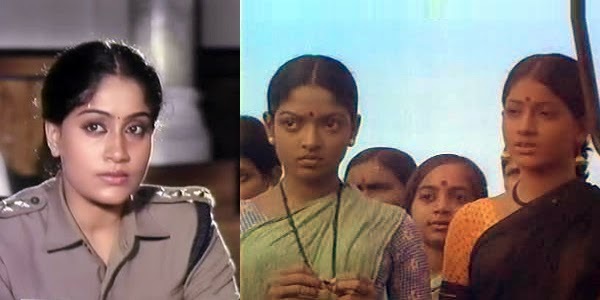 After this movie she became one of the few actresses to play leading heroine oriented movies like KARTAVYAM, in which she played the daring lady police officer. The role was inspired from the real life lady cop Kiran Bedi and fetched Vijayashanthi National Film Award from Indian Government and an Andhra Pradesh State award for best actress. Further her role in OSEY RAMULAMMA (Telugu) about a courageous rebellious woman in Telangana region made her popular as Ramulamma among the people. In the mid 80’s she proved her histrionics as a glamour girl and became an instant craze among movie buffs. A row of hits followed. Movies like CHALLENGE, DESODHDHAARAKUDU, PASIVADI PRANAM, MUDDULA KRISHNAIAH, AGNI PARVATAM, YAMUDIKI MOGUDU, ATHAKU YAMUDU AMMAYIKI MOGUDU, MUDDULA MAVAYYA, GANG LEADER and last but not the least MONDI MOGUDU PENKI PELLAM made her the number one actress and she became the highest paid actress. Readers would be stunned to know that she charged Rs. 1 Crore for a movie in the 90’s when other actress charged around 10 to 20 lakh! Her popularity became so intense that the media labeled her as the Amitabh Bachchan of Southern film industry.